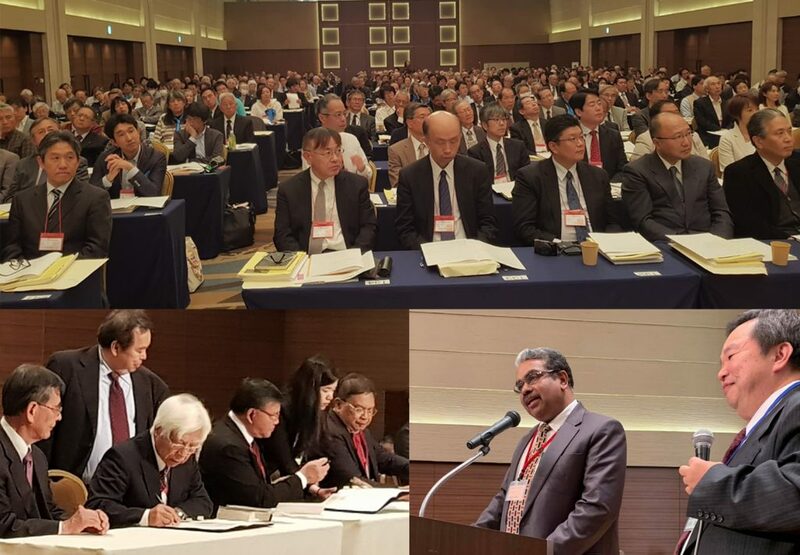 Two member churches of the Christian Conference of Asia, the United Church of Christ in Japan (Nihon Kirisuto Kyodan) – [UCCJ] and the Christian Evangelical Church in Minahasa (Gereja Masehi Injili di Minahasa) – [GMIM] entered into an historic mission agreement during the 41st General Assembly of the UCCJ held at the Metropolitan hotel in Tokyo, Japan from 23 to 26 October 2018. The signing of the mission agreement between UCCJ and GMIM was witnessed by more than 400 delegates of the UCCJ General Assembly, international guests, representatives of ecumenical and ecclesial organizations, as well as representatives of GMIM congregations in Japan. In a special ceremonial service on the second day of the assembly Rev. Ishibashi Hideo (Moderator of UCCJ), Rev. Toru Akiyama (General Secretary of UCCJ), Rev. Dr. Hein Arina (Moderator of GMIM) and Rev. Dr. Henny William Booth Sumakul (former Moderator of GMIM) signed the partnership agreement. As per the mission partnership agreement, the members of GMIM and UCCJ will be mutually involved in joint mission initiatives both in Japan as well as in Indonesia. CCA General Secretary Dr. Mathews George Chunakara, who presented on the occasion of the ceremonial signing of the UCCJ-GMIM agreement during the assembly, said that he was privileged to be present and witness the historic process of entering into mission agreement by two CCA member churches from Japan and Indonesia. The CCA General Secretary congratulated the leadership of UCCJ and GMIM for their sustained interest and vision of mutual partnership in the mission which will involve descendants of early Indonesian migrants in Japan, who are referred to as “Nikkei” Indonesians and have settled permanently in several parts of Japan. Dr. Mathews George Chunakara earlier addressed the assembly and recollected UCCJ’s long tradition of supporting CCA and the Asian ecumenical movement. Quoting the Epistle of Galatians 3: 23-26, the General Secretary of UCCJ Rev. Toru Akiyama said, “the UCCJ has partnership agreement with several other churches also in a spirit of mutual recognition based on our firm conviction and common belief that we are all one in Christ; we celebrate today God’s divine guidance in our new partnership with GMIM”. “The relationship between UCCJ and GMIM started during World War II through the role UCCJ played in pacification of the conquered areas. The signing of the mission partnership agreement between UCCJ and GMIM was the result of past ten years of dialogue and cooperation”, Rev. Akiyama added. Indonesians from the Minahasa region started working in Japan mainly in the fishing industries for more than 90 years. UCCJ has been sending missionaries to work in the area of the medical mission in the Minahasa region in the post-war period. As per the changed domestic laws in Indonesia, the GMIM congregations in Japan are eligible to affiliate with the GMIM Synod structure in Indonesia as full members. The mission partnership agreed between GMIM and UCCJ will help both churches to envision new avenues of joint mission and mutual collaboration to glorify God’s mission both in Japan and in Indonesia in the future, said Hein Arina, the Moderator of the GMIM. GMIM has about one million members and UCCJ has more than 250,000 members.